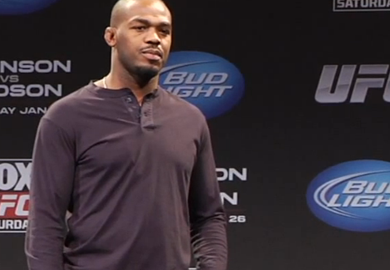 The dynamic between Jon Jones and Chael Sonnen is not a clear one. At times, the competitors seemed to be courteous on the Ultimate Fighter. But recently Jones has had enough of being cordial with Sonnen who has done his signature job of using his words to excite people for his fight. Sonnen who has in the past gotten TUE exemptions for testosterone replacement therapy due to low testosterone levels. Jones claimed that he wouldn’t do any talking or promoting for this fight, and even went as far as to keep quiet during an interview at the TUF 17 Finale. Jones saw the problem with that statement and apologized for it. As it seems to happen before every one of his fights, Jones is chomping at the bit just to get this fight going, because it’s the build up that he struggles with. The fight itself, usually a cakewalk for Jones.